Intensity Training is the most efficient way to burn fat and keep muscle while simultaneously increasing your cardiorespiratory efficiency! Pushing yourself outside your comfort zone (and into the anaerobic zone) is not only challenging but extremely rewarding. Get ready to see – and feel – amazing results! A fast-paced, fat-burning workout designed to maximize weight loss. 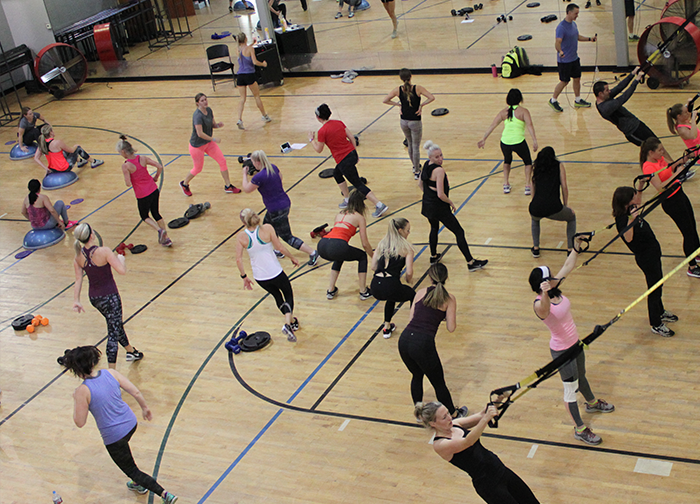 This class combines many aspects of fitness including plyometrics, basic weight lifting, core work, functional training, and more creating a non-stop, action-packed class! To keep your body guessing and responding, be prepared for something new and exciting each time Bootcamp is offered! High Intensity Interval Training has taken the fitness industry by storm! A fierce combination of body weight resistance training and equipment utilization will push you to your own outer limits! Jump in the action, squat through the pressure, and push through the burn and find the fierce fitness freak you know you are! (P.H.I.I.T: Plyometrics High Intensity Interval Training). *Mat recommended. The ever popular challenging, group-focused athletic training, cardio conditioning, and total- body strength drills, designed for people of all levels. The moves are easy to follow – but the workout WILL challenge you, change you, and get you in the best shape of your life. With a power jab, a swift cross, and a fierce uppercut you’re on your way to top kickboxing shape! Grab your gloves and step up to the kickboxing bag and increase your overall strength, confidence, and stamina. Geared towards both male and female participants. *Gloves highly recommended. The R.I.P.P.E.D. program is comprised of: Resistance, Interval, Power, Plyometrics, Endurance and Diet. R.I.P.P.E.D. The R.I.P.P.E.D. workout burns anywhere from 750-1000 calories and is ever-changing! With a power jab, a swift cross, and a fierce uppercut you’re on your way to top Combat shape! Increase your overall strength, confidence, and stamina in this Martial Arts inspired class. Geared towards both male and female participants.